Most of the time you will have all three ticked. Let's look at what they do! 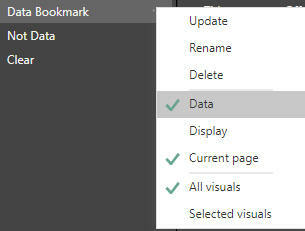 The page has a little bit of all of the features included in the Data option of bookmarks. Data option on. Data option off. Bookmark with Data option ticked. Bookmark with Data option not ticked. While the bookmark with Data ticked remain them same, the other reverted to its original unfiltered state. Why would you ever have Data off? One answer is when you want to stay on the same page and maintain any filters already in place, but change the images on the page. 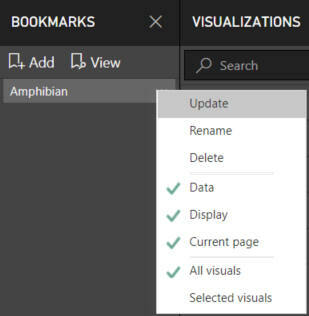 With Data on, the bookmark would revert to the filter settings set when it was created.